Sold by Dress MALL, who is devoted to developing formal occasion dresses for more than 10 years, such as wedding dress, evening dress, prom dress, casual dress, cocktail dress and so on. Since the establishment of this brand, the design team has always adhered to the design philosophy of inheritance and innovation, and been dedicated to customizing fashionable, classic, concise and elegant formal gowns! Material:High Quality Tulle and Shining Beaded Bodice. Two Piece Design. Colour :The picture colour is royal blue, if you like any other colours, please contact us , we can make for you . Custom-made Service is available without any Extra Cost.Please refer to our Size Chart and Color Chart. Email us your Exact Measurements of bust,waist,hips,hollow to floor,Height(barefoot)and Color Number after you placed the order. We need 5-7 daysto make a dress, shipping needs 5 day. Rush Order is Available,please email us your Event Date and we will try our best to rush it for you. 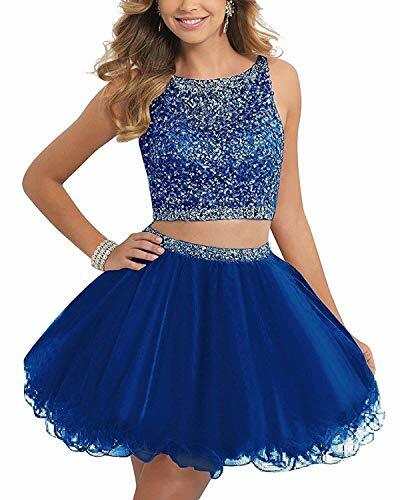 Occasion: Prom dress,Homecoming dress,Graduation dress,Evening,Ball,Dancing,Dating,Cocktail,Clubwear,Formal Party dress and other Special Occasions. If you have any doubts about this dress, please don't hesitate to contact us freely, and we are always at your service. 1.Items may slightly differ from photo in terms of color due to the lighting during photo shooting or the monitor's display.